Executive Summary: Perioperative Visual Loss (POVL)-Who is at risk, What should we tell patients preoperatively, and How should we manage their intraoperative care? APSF has produced a 10-minute long Executive Summary video of the APSF-sponsored conference, Perioperative Visual Loss (POVL)-Who is at risk, What should we tell patients preoperatively, and How should we manage their intraoperative care?, held in Phoenix, AZ on September 12, 2012. The intended audience is everyone who cares for patients at risk for POVL in the postoperative period. APSF believes that increased awareness and understanding of risk factors associated with perioperative visual loss (POVL) is a timely patient safety topic. Peer-review literature and data from the American Society of Anesthesiologists (ASA POVL Registry) are evolving in a manner that suggest a patient profile at risk for POVL and steps to take in the surgical and anesthetic management that might decrease the incidence of this devastating complication. There seems to be increasing acceptance that the informed consent for surgery and anesthesia should include the risk of POVL in selected patients. Yet the value of the informed consent to the patient is dependent on those responsible for their care to be cognizant of evolving information and strategies designed to reduce the risk of POVL. 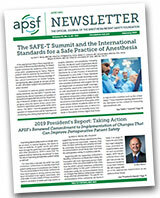 The complete report of the POVL conference is available in the Winter 2013 APSF Newsletter.